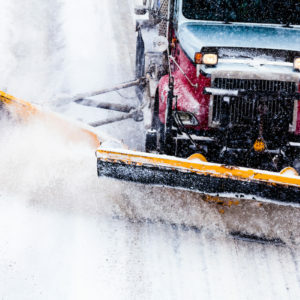 Snow plowing is a tough job and requires operating under difficult conditions such as slippery, snow-covered or ice-coated surfaces. High winds and blowing snow can create dangerous whiteout conditions and cause low visibility. If you own a private snow removal service, the best practice is to use a written contract for snow and ice removal. It is best if you do not assume liability for the entity you have entered into a contract with. It is also important to document your snow and ice services. Log time of arrival, conditions upon arrival, services performed and time exited once services are completed. Be sure you are well rested and prepared. Be aware of your surroundings and any obstacles. Visit your client’s locations prior to snowfall. Know your surfaces – lower plow shoes when plowing dirt or gravel so you do not scrape the surface away causing damage to a customer’s driveway or lawn. Raise or remove the shoes when plowing on asphalt so you can scrape as close to the surface as possible. Be very familiar with the way the equipment operates. Thoroughly check the vehicle and snowplow equipment, including the lights, before plowing. Keep the salt spreader clean and in operating condition to ensure better service and longer life of equipment. Spread a liberal amount of salt and sand to treat ice and snow adequately. Clean sidewalks before plowing parking lots so snow can be plowed away. Do not plow snow in an area that will block a driver’s line of sight and ability to see traffic. When backing up don’t rely on rear view mirrors, turn around and look where you are going. If possible, try to plow during low traffic hours and be cautious of pedestrians, domestic animals, and other vehicles. Be aware of the weather. If a significant amount of snow is expected, plow with the snowfall and not after it has all accumulated.